Montreal native Jean-Paul Mousseau was only seventeen when he met Paul-Émile Borduas and his circle of Automatistes. The following year, Mousseau signed the controversial manifesto Refus Global (1948). 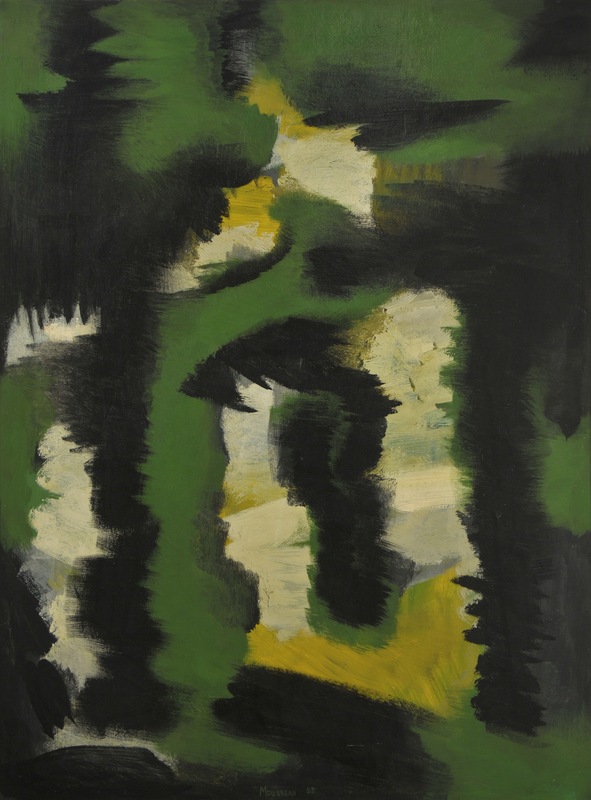 Until the group’s final exhibition in 1954, Mousseau would share the Automatistes’ interest in tapping the subconscious through expressive gesture in abstract painting. Of the Automatistes, Mousseau used the most vibrant palette, revealing a sensitivity to colour and light that is certainly expressed in this work. He also moved freely between the fine arts and so-called “craft,” such as jewelry making and glass design. Mousseau would apply his diverse talents to designing sets and costumes in the 1950s and, in the 1960s through to the 1980s, to creating a variety of public installations: for example, an ambitious backlit mural for the lobby of Hydro-Québec’s head office; a series of murals and ceramic tile installations in Montreal’s Métro system; exterior murals on industrial buildings; and interiors for discotheques. Mousseau was committed to the notion that all citizens should have access to art—and that art must reach beyond the traditional limits of the gallery and the frame. He shared these ideas with his students at both the École des beaux-arts de Montréal and Université Laval in the 1960s, encouraging them to collaborate with architects and designers, directors and public officials. Not least, in his role as Artistic Director of the Montreal Métro from 1972 to the mid-1980s, Mousseau contributed much to shaping public art policies within the city of Montreal.